I’m a little late with my holiday greetings. But as I said in my family newsletter (which I just sent out a few days ago), better late than never, right? I’ve been doing a lot of reflection the past couple of weeks, as is typical this time of year. And also looking toward the future of this year. Are any of you already planning for your spring and summer gardens? Now’s the time to order your seeds and in some cases, get them started indoors. I just read this online article (How to Pick Your Vegetable Seeds Without Going Crazy) and it’s got me dreaming! But alas, my biggest decision this year is that I am scaling way back on my plans for our garden. Any when you have a tiny plot anyway, “scaling way back” means that I don’t plan to do much of any gardening this year. So, I’ll probably throw some carrot seeds in the ground and call it good. Those were what did the best and we ate the most of last year. And I love that they are frost tolerant and you can leave them in the ground all season and just go out and grab some as you need them. It kills me not to really be making plans for the garden. But the trade off is worth it as we make progress on our house. A couple days ago was a fairly mild day here in the Portland area, overcast but dry and not too cold. So I used the opportunity to get outside and do some yard work. Almost done! And it’s a good thing, too, because the debris can is almost full! I scooped up the walnut leaves and put them in the yard debris can. 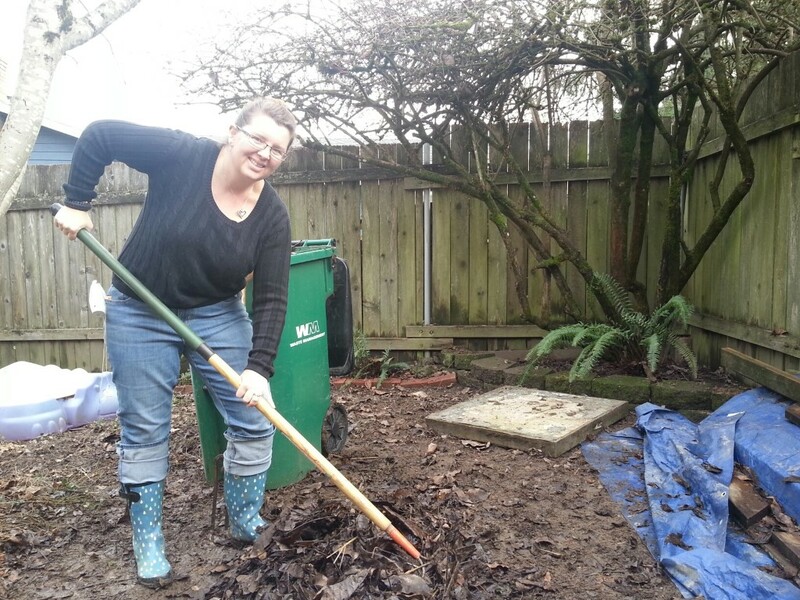 Yes, we have a compost pile, but not the right set up to cook the toxins out of walnut leaves. Just after New Years, we had snow here. It was a rare treat for us in the Pacific Northwest. Normally, any time there’s snow here, it’s covered in ice. This was a light, fluffy, “dry” snow. At the beginning of the day it wouldn’t even compact into snowballs. The girls and I spent 3 hours playing outside. snow angels in the street, because, why not? The wild onions are already growing! And the snow didn’t seem to affect them at all. Our back yard looked quite different with a thin layer of snow. My little 25sqft garden with the caterpillar eaten kale and aphid eaten brussels sprouts, neither of which did I harvest much of because I was too busy to deal with the pests. And then, that night, a freezing rain came in, covering everything in a layer of ice. A really cool ice leaf found by Flower Girl. For this girl from the desert, ice storms are pretty magical. It is surreal to see ice coating everything. However, I am glad no one in our family had to go anywhere. One of those times I am thankful that my man works from home. 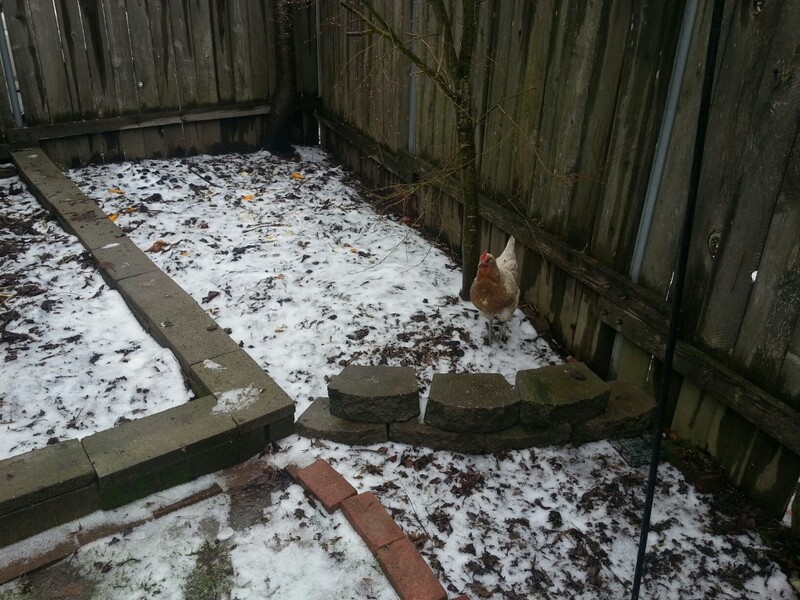 The hens don’t mind a bit of snow. We had a bit of sad news recently. One of our hens (“Pepper”) was killed by a predator of some sort. Considering it was during the middle of the day in broad daylight, we think it was one of the many neighborhood cats. Flower Girl with Pepper this past spring. And in the mean time, we’re dreaming. We’re dreaming big! 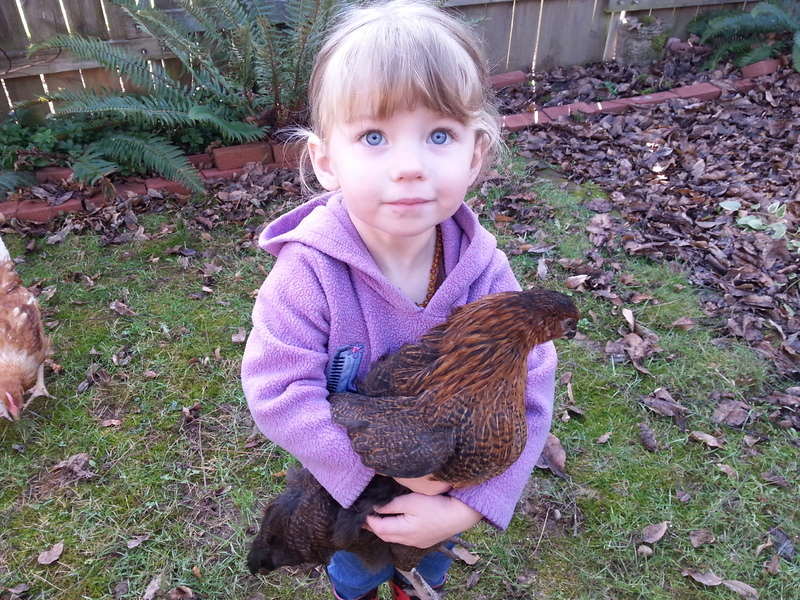 This entry was posted in Newsy Stuff, Portland Interlude 2014-2016, Urban Farming and tagged Backyard Chickens, Chickens, Eggs, Family, Garden, Gardening, Green!, Hens, Homestead, Homestead Kids, Pacific Northwest Gardening, PNW Gardening, Urban Farm, Urban Gardening, Urban Homesteading on January 16, 2016 by Maridy.